Dubois is a town in Fremont County, Wyoming. 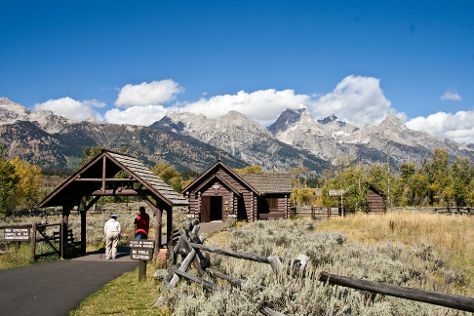 Step off the beaten path and head to Jenny Lake Trail and Dubois Museum: Wind River Historical Center. Get outdoors at Grand Teton and Amphitheater Lake. And it doesn't end there: explore the striking landscape at Inspiration Point, learn more about the world around you at National Bighorn Sheep Interpretive Center, and identify plant and animal life at Wind River Flyfitter. To find photos, more things to do, traveler tips, and other tourist information, use the Dubois trip itinerary builder site . Tampa to Dubois is an approximately 10-hour flight. You can also drive. The time zone changes from Eastern Standard Time (EST) to Mountain Standard Time (MST), which is usually a -2 hour difference. In June, Dubois is colder than Tampa - with highs of 70°F and lows of 42°F. Wrap up your sightseeing on the 5th (Wed) to allow time to travel to Mesa Verde National Park. Deepen your sense of the past at sights like Spruce Tree House and Long House. Escape the urban bustle at Petroglyph Point Hike and Spruce Canyon Trail. And it doesn't end there: delve into the distant past at Cliff Palace, get to know the fascinating history of Far View Sites, examine the collection at Chapin Mesa Archeological Museum, and hike along Knife Edge Trail. For maps and other tourist information, refer to the Mesa Verde National Park vacation planning tool . Use the Route module to find suitable travel options from Dubois to Mesa Verde National Park. While traveling from Dubois, expect somewhat warmer days and about the same nights in Mesa Verde National Park, ranging from highs of 89°F to lows of 46°F. Wrap up your sightseeing on the 9th (Sun) early enough to travel to Nashville. Step out of the city life by going to Centennial Park and Bicentennial Capitol Mall State Park. You'll explore the less-touristy side of things at Carter House and The Escape Game Nashville (Downtown). Take a break from Nashville with a short trip to Carnton in Franklin, about 34 minutes away. There's lots more to do: appreciate the extensive heritage of Downtown Franklin, examine the collection at The George Jones, steep yourself in history at Lotz House Museum, and snap pictures at Cumberland River Pedestrian Bridge. For traveler tips, ratings, more things to do, and tourist information, read Nashville day trip website . Getting from Mesa Verde National Park to Nashville by combination of taxi and flight takes about 9 hours. Other options: drive; or take a bus. The time zone difference when traveling from Mesa Verde National Park to Nashville is 1 hour. Plan for much hotter nights when traveling from Mesa Verde National Park in June since evenings lows in Nashville dip to 67°F. Finish your sightseeing early on the 13th (Thu) so you can drive to Gatlinburg. Get a sense of the local culture at Tennessee Homemade Wines and Hollywood Star Cars Museum. Visiting Grotto Falls Trail and Roaring Fork will get you outdoors. You'll find plenty of places to visit near Gatlinburg: Roaring Fork Motor Nature Trail (in Great Smoky Mountains National Park), Tuckaleechee Caverns (in Townsend) and Sevierville (Smoky Mountain Knife Works & Forbidden Caverns). There's lots more to do: take in the dramatic scenery at Laurel Falls, have some family-friendly fun at 7D Dark Ride Adventure, putt your heart out at Hillbilly Golf, and test your problem-solving skills at The Escape Game Pigeon Forge. For other places to visit, photos, and tourist information, go to the Gatlinburg trip itinerary site . Getting from Nashville to Gatlinburg by car takes about 4 hours. Other options: do a combination of flight and taxi; or do a combination of flight and car. Traveling from Nashville to Gatlinburg, you'll lose 1 hour due to the time zone difference. In June, daytime highs in Gatlinburg are 86°F, while nighttime lows are 66°F. Finish up your sightseeing early on the 18th (Tue) so you can go by car to Cherokee. The center of Cherokee culture in the eastern part of the country, the town named after this Native American tribe serves as a base camp for hiking in the Great Smoky Mountains. For shopping fun, head to The Cottage Craftsman or Qualla Arts and Crafts Mutual. You'll explore the less-touristy side of things at Museum of the Cherokee Indian and Clingmans Dome. Explore Cherokee's surroundings by going to Wheels Through Time Transportation Museum (in Maggie Valley), Topton (Lakes End Marina & Carolina Outfitters) and Dry Falls (in Highlands). And it doesn't end there: take a memorable tour with Tours, take in the dramatic scenery at Mingo Falls, get engrossed in the history at Mountain Farm Museum, and view the masterpieces at Oaks Gallery at the Riverwood Shops. To find reviews, photos, and more tourist information, read our Cherokee driving holiday planner . Traveling by car from Gatlinburg to Cherokee takes 1.5 hours. Plan for little chillier temperatures traveling from Gatlinburg in June, with highs in Cherokee at 81°F and lows at 59°F. Finish up your sightseeing early on the 22nd (Sat) so you can go by car to Asheville. Escape the urban bustle at Zipline and Sliding Rock. Get a sense of the local culture at Southern Highland Craft Guild Folk Art Center and Basilica of Saint Lawrence. Explore the numerous day-trip ideas around Asheville: Chimney Rock at Chimney Rock State Park (in Chimney Rock), DuPont State Recreational Forest (in Cedar Mountain) and Looking Glass Falls (in Pisgah Forest). The adventure continues: explore the striking landscape of The North Carolina Arboretum, surround yourself with nature on a nature and wildlife tour, view the masterpieces at Lexington Glassworks, and indulge your thirst for a good beer at Sierra Nevada Brewing Co. Tours & Tastings. For photos, where to stay, more things to do, and other tourist information, you can read our Asheville itinerary maker website . Traveling by car from Cherokee to Asheville takes 1.5 hours. Alternatively, you can do a combination of taxi and bus. In June in Asheville, expect temperatures between 83°F during the day and 62°F at night. Wrap up your sightseeing on the 26th (Wed) early enough to travel to Nags Head. Visit Pea Island National Wildlife Refuge and Coquina Beach for some beach relaxation. Deepen your sense of the past at sights like Bodie Island Lighthouse and Currituck Beach Lighthouse and Museum. Step out of Nags Head with an excursion to Nature & Wildlife Tours in Corolla--about 50 minutes away. There's still lots to do: explore the striking landscape at Jockey's Ridge State Park, have some family-friendly fun at Outer Banks Old Time Photos, admire nature's wide array of creatures at North Carolina Aquarium on Roanoke Island, and fly like a bird with a parasailing or paragliding tour. Discover how to plan a Nags Head trip in just a few steps with Inspirock's itinerary builder. Traveling by combination of flight and car from Asheville to Nags Head takes 6.5 hours. Alternatively, you can drive; or do a combination of bus and car. Traveling from Asheville in June, Nags Head is a bit warmer at night with lows of 70°F. Wrap up your sightseeing on the 30th (Sun) early enough to travel back home.